Congressman Marsha Blackburn (TN-7) has introduced legislation to rein in the Transportation Security Administration and provide more transparency for American travelers. H.R. 3608, the Stop TSA's Reach In Policy (STRIP) Act, would prohibit any TSA employee not trained as a federal law enforcement officer or eligible for federal law enforcement benefits from wearing law enforcement uniforms or wearing a police-like metal badge. In 2005 TSA made administrative changes reclassifying the title of airport security screeners to Transportation Security Officers (TSO's) and changed their uniforms to resemble those of a federal law enforcement officer. 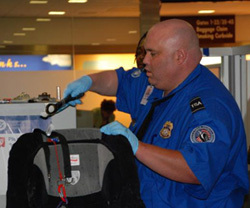 In 2008, TSA added metal badges to the uniforms, similar to those worn by federal law enforcement. However, TSO's are not required to receive any law enforcement training and they are not eligible for federal law enforcement benefits. Despite the fact that TSO's are 'officers' in name only, some have chosen to abuse their limited authority against the unsuspecting public. Earlier this year in New Jersey, a TSO was arrested for impersonating an officer and days before Thanksgiving a Virginia woman was brutally raped after a TSO approached her in uniform, waving his badge. “It is outrageous that in a post 9/11 world that the American people should have to live in fear of those whose job it is to keep us safe," Blackburn said. "Congress has sat idly by as the TSA strip searches 85 year old grandmothers in New York, pats down 3 year olds in Chattanooga, and checks colostomy bags for explosives in Orlando. Enough is enough! The least we can do is end this impersonation which is an insult to real cops."